People are divided into two based on the colour of their blood – Silver and Red. Silvers have superpowers, which they use to lord over the Reds, who are given menial jobs to serve the Silvers. Mare is a Red who discovers that she has powers. Upon discovering her anomaly, the Silver royal family gets her engaged to the second prince, Maven. Mare is given a false background story to pass her off as a Silver, and undergoes training to perfect her skills. She shares a charged, awkward and confusing relationship with Cal, the crown prince, who is engaged to Evangeline, a Magnetron. Mare is recruited by the Scarlet Guard, a Red rebel society that aims to overthrow the government and establish equality. Maven also supports the Guard. Together, they help the Guard plan assassinations and attacks on the nobles. Through Julian, her teacher, she learns that several soldiers’ bodies, her brother’s included have been ‘misplaced’, and their blood samples show that they all share a certain mutation. He believes that they could also have powers like Mare’s. The Guard plans a coup at the capital to overthrow the government, but the plan goes awry when their key element, Cal, doesn’t act as they assumed he would. Mare and Maven are captured and taken before the King. Here, Maven reveals his true colours; he’s been conspiring with the Queen the entire time, manipulating Mare, and plotting to steal the crown. 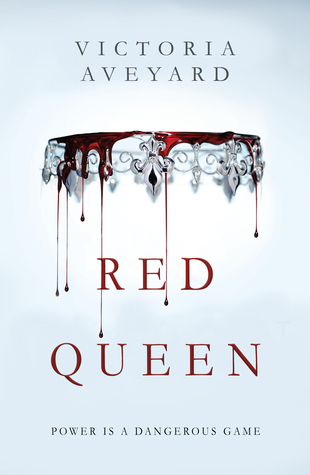 The Queen seizes control of Cal’s and the King’s minds; she makes Cal kill the King. Cal and Mare are sentenced to death, and Maven is declared king. During the fight to the death, the Guard comes to rescue them both. They are smuggled away, and travel in an Undertrain. Cal & Mare realise they have a common enemy – Maven. Mare helps her family survive by stealing and pawning off the trinkets. Her eighteenth birthday is hast approaching, and if she doesn’t have an apprenticeship by then, she’ll be conscripted into the army, to fight the Lakelands. Her best friend, Kilorn, is apprenticed to a fisherman. One night, Kilorn’s master dies, and since he’s already eighteen, it’ll only be a short while before he’s conscripted. Mare proposes that they both leave the Stilts and run away. She goes to Will Whistle, who has connections to the black market, and seeks his help. He introduces her to Farley, who accepts to transport them on behalf of the Scarlet Guard. She asks for payment to the equivalent of 1000 crowns. Mare goes to Summerton with Gisa, her sister, to steal the money. While there, news comes of a series of terrorist attacks in the capital and government buildings. A Red rebel society called the Scarlet Guard claims responsibility for the attacks. The local Silvers turn against the Reds and in the scuffle, Gisa is caught. The bones in her hand are shattered, but the guards eventually let Mare and Gisa leave Summerton. Mare goes to town to pick pockets and is caught by a Silver who calls himself Cal. He later lets her go and gives her a crown. The next day, Mare is summoned to the palace at Summerton, and given a post as a server. She is to serve the royals and nobles during Queenstrial, a contest to choose a wife for the crown prince, who *gasp* turns out to be Cal from the day before, aka Prince Tiberias Calore VII. One of the contestants, Evangeline from House Samos, a Magnetron, causes the seating boxes to tilt, and Mare looses her footing. She falls towards the pit of the arena, which is covered by a lightning shield (which is exactly what is sounds like). But Mare is unharmed, and in fact feels energized by the electricity running through her body. She involuntarily blasts through the shield. Upon hitting the ground, she knows she’s got to disappear and escapes through a hatch in the ground. She is pursued, and caught by Cal. The Queen Elara interrogates Mare thoroughly. They need to cover up the fact that a Red has powers, so they give her a fake background, and get her engaged to the second son, Prince Maven. The queen agrees to Mare’s demands that her brothers be brought back from the war, her family be taken care of, and Kilorn not be conscripted. Mare is given training in different areas – grooming, combat, and traditional knowledge. During her lessons with Julian Jacos, brother to the previous queen, who teaches her how to manage her power, they discover that Mare can produce electrical energy. This is unheard of among the Silvers, as no one can create anything, but can only manipulate that which already exits. Cal helps Mare sneak out of the palace and visit the Stilts. She discovers that her brother Shade tried to desert the army, and was executed. On the way back, she meets Kilorn and a few of his friends. Mare joins the Scarlet Guard. Later, Maven joins the Guard too. He gives up the names of four prominent Silvers to Farley, for potential assassinations. During a ball, the Scarlet Guard carries out the assassinations. Cal captures some of the perpetrators; Kilorn and Farley are among them. Cal recognizes Kilorn and looks to Mare for an explanation. Mare says that she got him a job in the palace to help him out. Cal starts questioning the prisoners, and when they don’t give up their secrets, they use torture. Ptolemus Samos, Evangeline’s brother and one of the targets, survives and kills Tristan, one of the prisoners. Later that night, Mare and Maven help the prisoners escape, with Julian’s help. Mare is shot during the escape, but gets healed by Julian’s friend. The next day, the royal entourage is leaving Summerton for the capital, Archeon. When Mare goes to bid farewell to Julian, she discovers that his classroom has been destroyed. He’s also leaving; he’s been offered another job in Delphie, with the archivists. He gives her a gift. During the investigation into the prisoners’ escape, Red blood was found in the cells. Mare fears that they will discover her part in the escape once they match her blood in the blood bank. The King releases a video in which Mare declares that the treatment the Reds receive from the Silvers is fair and just, and she is made to denounce the Scarlet Guard. The Reds are offered huge rewards for any information regarding the Guard or any of its members. In Julian’s gift, Mare finds the list of 27 Red soldiers whose bodies were ‘cremated’ or ‘lost’ or ‘misplaced’, & among them is Mare’s brother Shade. This is impossible, as Red bodies are only buried, and ‘misplaced’ bodies are nonexistent. Julian has written that all these 27 soldiers and Mare share a certain mutation that makes them different from both Reds and Silvers. He urges Mare to find them, for they could mean a new beginning. Maven helps wipe Mare’s data from the blood bank. They meet up with the Scarlet Guard at the capital. Farley takes them south, towards the lands that have been radiated and now stand as wastelands. But the Guard reveals that one island is indeed alive – the City of Ruins, Naercey. They plan a coup to overthrow the Reds. During the coup, Cal has the choice to either throw in his lot with Mare and the Guard and use his soldiers to help them to victory, or stand with the Crown. Mare tries to convince him to do what is right, and fight for equality, but he refuses to listen. He captures Mare, Maven and sends soldiers after the rest of the Guard. Maven and Mare are taken to the King and Queen. Arven the Silencer, neutralizes their power. The King is Elana takes control of Cal and the King’s minds. Mare is horrified to realise that Elana has been the one pulling the threads all along, and Maven was in cahoots with her. They were manipulating the Guard and Mare to reach a conclusion that played to their own advantage. Elana uses Cal to kill the King with his own sword. Cal and Mare are arrested for high treason and regicide. They are thrown into the Bowl of Bones, where they will spend the days leading up to their execution. Maven is declared King. Mare and Cal are pitted against the best fighters from the various houses in a fight to the death. Arven neutralizes Mare’s power during the fight, but she manages to trick one of the fighters and gets Arven killed. Against all odds, Mare and Cal defeat all the fighters, but Maven sends in a battalion of soldiers to shoot them down. Mare uses her power to control a lightning storm that’s been brewing above them, to buy some time. The Guards come to their rescue, shooting the soldiers and pulling Mare and Cal to safety. They wake up in an Undertrain with the Scarlet Guard. Shade is alive, and Cal is chained. Mare and Cal realise that while there may no longer be any love between them, they still have one thing in common: their hatred for Maven. Thanks for the recap! I will be referencing it at some point on my blog, Simply Books. Aw, thanks Leila! Glad it was helpful.